There are some venues in sports that are musts for any sports fan’s bucket list. While NFL stadiums are popping up by the minute as innovative as ever, and MLB ballparks stand the test of time, college football stadiums hit the sweet spot, with just enough old and new. So which schools have the top stadiums in college football? Frankly, we could probably list 50 stadiums and why they’re unique and just as good as the others. The Los Angeles Coliseum has hosted the Olympics. Bryant Denny Stadium has the Walk of Champions. Sanford Stadium has a hedge surrounding the field. But below is our list of the top 12 college football stadiums. Sun Devil Stadium (Arizona State) – A football stadium built between natural structures, this stadium isn’t one of the biggest, but it’s cozy and makes for a noisy evening thanks to the surrounding landscape. 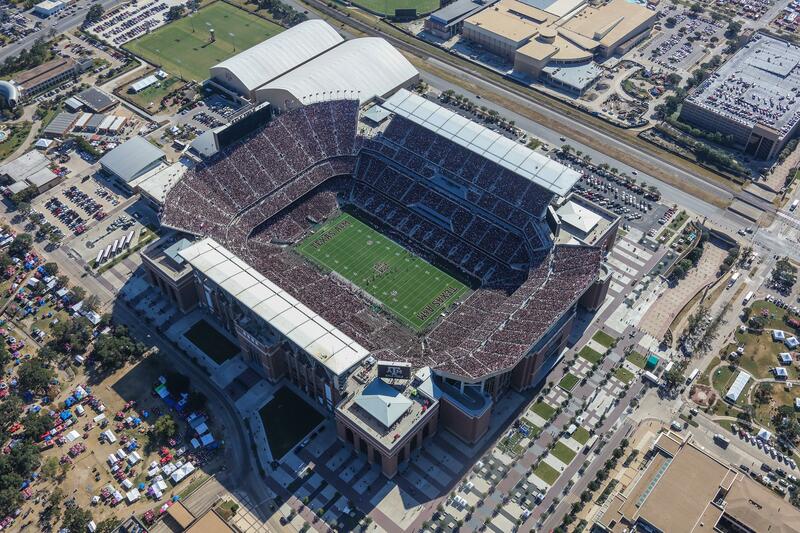 Kyle Field (Texas A&M) – Kyle Field has been a problem for visitors of the Aggies for decades, but the renovation to close the open end of the stadium and add another near-20,000 seats makes it one of the scariest in the SEC. The gates were given a modern look as well in the renovation. Rose Bowl (UCLA) – The host venue of the Rose Bowl Game, or “The Granddaddy of Them All”, Rose Bowl Stadium is recognized as a National Historic Landmark. Located in Pasadena, the mountains provide a picturesque background for those in attendance. 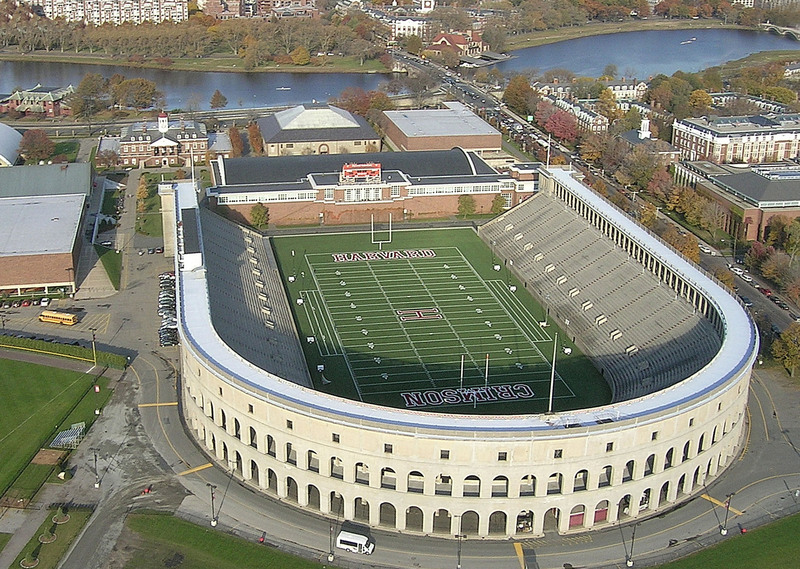 Harvard Stadium (Harvard) – Harvard Stadium is the oldest permanent concrete football stadium in college athletics, having been built in 1903. The window-like openings in the concourse area give it the feel of the Roman Coliseum. Michie Stadium (Army) – For a venue that is more than 90 years old, Michie Stadium doesn’t look it. With modern entrances and an unbelievable 360-degree view surrounding the stadium, Army’s home is one of the best to take in. Notre Dame Stadium (Notre Dame) – Just as iconic as its football program, Notre Dame’s stadium is a site to behold. From the cathedral-like entrances to the view of the Golden Dome on campus, this stadium is a must. Doak Campbell Stadium (Florida State) – Doak is the largest continuous brick structure in the country and has a capacity just under 80,000. Be sure and check out the statue of Osceola and Renegade on your way in to do the tomahawk chop. 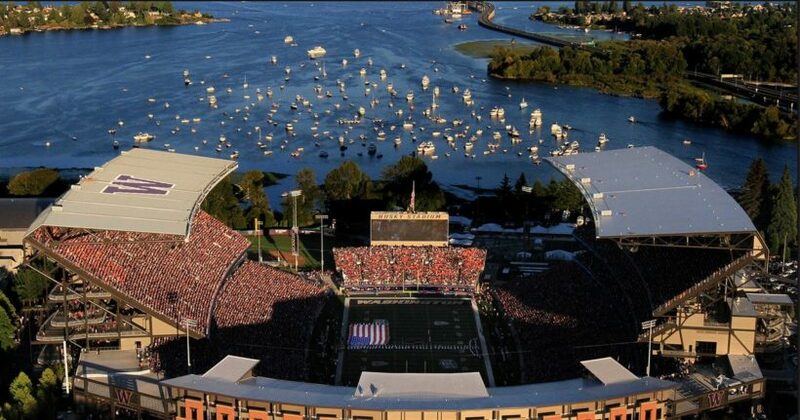 Husky Stadium (Washington) – Very unique in design, Husky Stadium is a horseshoe structure with upward extensions on each sideline. Looking through the open end zone gives you an incredible view of Union Bay. Tiger Stadium (LSU) – Known as Death Valley because visitors rarely escape with a win, Tiger Stadium is as intimidating as stadiums come. Since its opening in 1924, renovations have brought the capacity up by more than 90,000. It has been called the loudest stadium in the country. Autzen Stadium (Oregon) – Autzen Stadium is a unique structure that creates quite the ruckus. Surrounded by trees, many coaches and players have called it pound-for-pound the loudest stadium in the country, referencing its low stadium capacity. Ohio Stadium (Ohio State) – The Horseshoe is not only one of the largest stadiums in the country, but the world. The partially-enclosed opening in the horseshoe design pushes the capacity well over 104,000. The rotunda is worth seeing while you’re there. Memorial Stadium (Nebraska) – The stadium with the NCAA record for consecutive sellouts tops our list. The Sea of Red form the third-largest city in the state of Nebraska any time the Cornhuskers play at home. Recent renovations allowed the stadium’s original exterior to be used as interior reinforcement. For college football tickets, click on your team’s name above, or visit us at TicketCity.com.